Laughter is key: Helena Montegrande delights in spending the day with seniors. AFTER career changes and even a time of voluntary ministry, reliant on God’s providence to make ends meet, Helena Montegrande has found her niche. 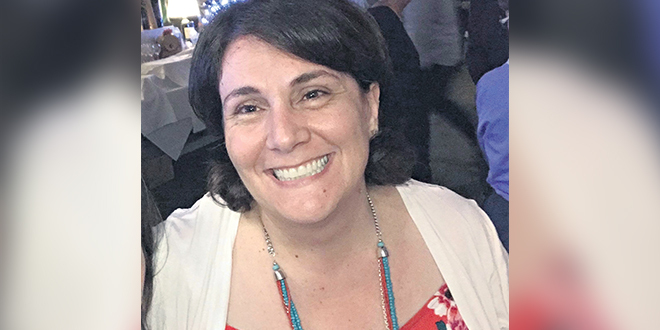 The 39-year-old Petrie parishioner “finds great joy” in working with people almost twice her age. “I just love it,” Helena said of full time work within Italian welfare. For five years, musically-minded and faith-driven Helena has co-ordinated up to 50 clients a day, mostly Italians, but also those of other nationalities in a program of socialisation and activity where the focus is on fun and connectedness. She first began this work on a smaller scale. “I started in their home, helping clients with domestic assistance,” Helena said. For two of those weekdays Helena works with those with dementia, a group she described as “respite for families”. Growing up on a family farm on Brisbane’s north, Helena said she’s often the one experiencing the most enjoyment and fulfilment when among clients. “The dementia group is so different and I love it,” she said. “I bring my guitar and play old Italian songs as they dance. It’s fun … they love anyone who sings and can play music. The “social group” during the other weekdays, where clients are transported to and from the venue, from their homes, is a mix of “a lovely morning tea, playing Bingo or cards with a good Italian lunch that has to be up to standards”, Helena said. The group often have themed activities such as the recent gathering for St Patrick’s Day where “everyone wore green”. All the while, Helena said her Italian speaking skills are “hopeless” but understanding undoubtedly comes through kindness, friendship and good humour. Italian seniors attest to Helena’s welcoming smile and warm nature. Her mum Rosa Montegrande, founder of the prayer-driven outreach of Women of the Way some 22 years ago, described her daughter as “faithful to all she does”. Mother and daughter, with an unmistakable bond of unwavering faith in God, have been gripped by and united in family tragedy. Helena’s brother Bernard died tragically in 1992, when she was 13, and her father Tony, died of cancer when she was 15. Asked if she is drawn towards older people because of the loss of her father, the candid woman of faith didn’t hesitate. “Sometimes I look at someone and think, ‘That person reminds me of dad’,” she said. “He would have been 83 this year … (and) that’s the age of some of the clients. Helena said the Italian clients “are all very caring” and spending time with the women especially “is like having lots of aunties around”. Mrs Montegrande led her daughter to greater consolation and faith expression through their shared involvement in the charismatic renewal while the family matriarch said Women of the Way was “born out of pain and has kept going” as an outreach. All the while, remaining a Petrie parishioner and involved in music ministry, Helena also worshipped and served within Emmanuel Community, first serving on National Evangelisation Teams (NET) after high school and then, the university-based ministry of Freedom. It was this friendship base that helped her meet the extraordinary subsequent challenge of injuries sustained from falling into a bonfire on the family farm 16 years ago. “I slipped and went feet first,” she said of the accident. “My knees and hands were burnt but thank God I had steel-capped boots on because it only melted the leather on my boots. Gifted with playing guitar and as a musician in Petrie parish since her mid-teens, Helena was “worried” she’d “never play again” because emergency surgery was required to save one of her fingers. Her worry was doused by the faith and encouragement of family and friends. “I had so much support,” Helena, who also studied and worked in childcare, said. Knowing God “turns challenges into blessings”, Mrs Montegrande said she asked God, on the way to the hospital all those years ago, what it would be. Within nine operations to restore Helena’s hands to what she knows and uses today, especially to play the guitar, the women had an answer. “I asked God what good he would bring out of this one (accident) and He did, in His glory,” Mrs Montegrande said. While receiving treatment in the form of skin grafts, Helena discovered what she described as a freckle, where doctors were to remove skin and place on her hands. Tests revealed the “freckle” was a stage two malignant melanoma. “Because of (treatment to) my hand, they found the melanoma,” she said. “If not, I would have been dead by (age) thirty. “A blessing came out of the accident because what I thought was a freckle was in a place that never sees the sun so I wouldn’t have had it checked. Today, Helena, with no history of melanoma in the family, has her skin “regularly checked” and continues to be realistic about the past, hopeful for the future and grateful for her mum’s unwavering faith in God. “Growing up was tough, with our losses,” Helena said. “But it meant I grew up fast … (and) our struggles are part of our life. “I loved being on the farm and Mum’s faith is something we all admire in her. Toe-tapping Helena has not only found her niche but also the key to longevity. “Laughter and social interaction are two of the biggest things that are beneficial for long life,” she said. “There’s nothing worse than if you’re down in the dumps and home alone. “My work is great for a laugh and a chat with the clients. I love making a difference to their lives. “As the youngest worker, and with some of my work colleagues in their seventies, we joke and say I’ll be looking after them one day.